Don Walsh (born November 2, 1931) is an American oceanographer, explorer and marine policy specialist. He and Jacques Piccard were aboard the bathyscaphe Trieste when it made a record maximum descent into the Mariana Trench on January 23, 1960, the deepest point of the world's oceans. The depth was measured at 35,813 feet (10,916 m), but later and more accurate measurements have measured it at 35,798 feet (10,911 m). Walsh has been associated with ocean science, engineering, and marine policy for more than 50 years. He was commissioned as an officer in the United States Navy upon graduation from the United States Naval Academy in 1954. He attained the rank of Captain by the time he retired. He spent 15 years at sea, mostly in submarines, and was a submarine commander. He worked with ocean-related research and development for the Navy. Serving as Dean of Marine Programs and Professor of Ocean Engineering at the University of Southern California, Walsh initiated and directed the university's Institute for Marine and Coastal Studies. In 1989 his company, International Maritime Incorporated, contracted a joint venture with the P.P. Shirshov Institute of Oceanology to establish an underwater maintenance company, Soyuz Marine Service, which continues to operate in the Russian Federation. Walsh received a Bachelor's degree in Engineering from the U.S. Naval Academy, a Master's degree in Political Science from San Diego State University, and a Master's degree and a Ph.D. in Physical Oceanography from Texas A&M University. He was appointed by Presidents Carter and Reagan to the U.S. National Advisory Committee on Oceans and Atmosphere, was a member of the Law of the Sea Advisory Committee for the U.S. Department of State, and served as a member of the Marine Board of the U.S. National Research Council from 1990 to 1993. Walsh was named one of the world's great explorers by Life magazine. In the MIR submersible, he dived on the RMS Titanic, the German battleship Bismarck, and the Mid-Atlantic Ridge. He has spent more than five decades traveling the world conducting research in, on, and around the oceans. On April 14, 2010, The National Geographic Society bestowed its greatest honor, the Hubbard Medal, on Walsh in a ceremony in Washington, D.C. at the National Geographic headquarters. The U.S. Navy awarded Walsh its Distinguished Public Service Award. Walsh lives with his wife Joan in the DoraSitkum area of Oregon, near Coquille. 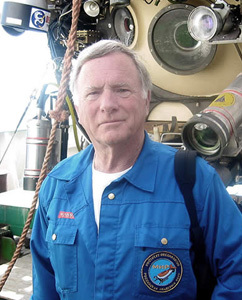 He has managed a marine consulting business since 1976, and conducts about 5 deep-sea expeditions per year. It was reported in 2010 that Walsh visited the deep-sea submersible Jiaolong and its makers at the China Ship Scientific Research Center. The craft had "planted a Chinese flag on the bottom of the South China Sea during a two-mile-deep dive in June" as the Chinese programwhich Walsh characterized as "very deliberate" -- proceeded toward its ambitious goal of going to 7,000 meters, or 4.35 miles, in 2012. Walsh joined the team that oversaw the dive of the Deepsea Challenger mission where James Cameron dove solo to the bottom of the Mariana Trench on March 26, 2012. Don Walsh went to sea with the Navy a half century ago. Enlisting as an Airman in 1948, he retired as a Captain in 1975. After graduation from Annapolis he served in submarines, including command of USS Bashaw in the late 1960s. Naval service included both Korean and Vietnam wars. In addition to submarines, Walsh was designated the Navy’s first deep submersible pilot when he had command of the Bathyscaph Trieste from 1958-1962. In 1960 he and Jacques Piccard piloted Trieste to the deepest place in the world ocean…seven miles down in the Marianas Trench. For the past 40 years he has remained active in the design, construction and operation of deep submersibles. Walsh has also worked at the North and South Poles and has made 30 expeditions to the Arctic and 20 to the Antarctic. From November 2002 to February 2003 he made a 70-day circumnavigation of the Antarctic continent on a Russian icebreaker. A mountain ridge, “The Walsh Spur,” is named after him in the Antarctic. After Navy retirement 1975, Dr. Walsh became dean of marine programs and professor of ocean engineering at the University of Southern California. Leaving USC after 10 years he started International Maritime Inc. a consulting practice that he still heads. Walsh served for six years as a Director of The Explorers Club, which elected him as an Honorary Life Member and Honorary Director. He is a recipient of the Club’s Lowell Thomas Medal and its highest award, The Explorers Medal. He lives Dora Oregon, population 10. When not working around his ranch, he flies his experimental biplane.